You have put in the hard work, and now it is time to expand! 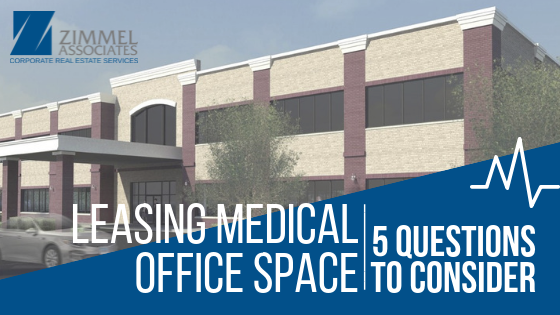 Expanding your medical practice can be a large expense, so choosing the right office space is a major decision that can impact your practice in multiple ways. At Zimmel Associates, we make your relocating experience easy and offer the support you need. Here are answers to five questions to help you get started with your move. Having the wrong-sized space can be one of your biggest pitfalls. To assist in determining your current and future needs, you may want to enlist the services of an architect to help with your decision making. They will be able to evaluate your current office, understand your likes and dislikes, and determine the inefficiencies that may occur from your current design. Just as important is choosing an architect that knows medical design and current practice trends and one that will understand your unique office flow. 2. Is the location right for my patients? You want an office space that’s nearby for your patients, so an urban location needs to be conveniently located near public transportation and parking. If you’re moving to the suburbs, some patients may decide that the trip isn’t worth it, so consider whether or not the lower cost makes up for lost business. Then consider the impact on your key employees- a longer commute may drive them to work elsewhere. 3. What is the best lease term? A longer lease generally gives you more negotiating power and better business terms. Your first need to determine what you can afford. Is there free rent being offered? Is the landlord offering money for the build-out of your office? What are the annual expenses and who pays for them? Is this a triple net lease or full service? Yep, it’s complicated- but the Zimmel team will help you answer these questions. Give us a call today and let us walk you through the different lease terms and options. 4. Should I be close to other physicians or hospitals? Do I need to be on or off campus? In the past, most practices needed the comfort of an on-campus presence; however, based on the recent changes in medicine and the premium expense to be on campus, physicians are locating to nearby, off-campus office buildings to save money. Although not on campus, these locations are still close enough to have convenient access to hospital services. In the past, being in the same office building with other referring physicians could guarantee additional revenue. Today, driven by cost savings, many practices choose the more economical, non-medical office building rather than having the security of an all-physician building. 5. Is a broker the right move for me? It is very important that you seek to get help from an expert. A corporate real estate broker will assist in locating and negotiating the best terms for your medical practice. They will have the market knowledge to save you time in searching for the right location, which will allow you to do what you do best: see your patients. The one catch is to make sure you hire a broker with MEDICAL office experience, like Zimmel Associates. Patients use specialists; you should too. Zimmel Associates is an Edison, NJ-based commercial real estate services firm that provides fully integrated brokerage, consulting, investment and property management services for local, regional and national clients. Established in 1986, Zimmel Associates represents more than five million sq. ft. of exclusive office, industrial and flex space throughout New Jersey.